Well, its happened, I've made the ultimate "guilt-free" comfort food. 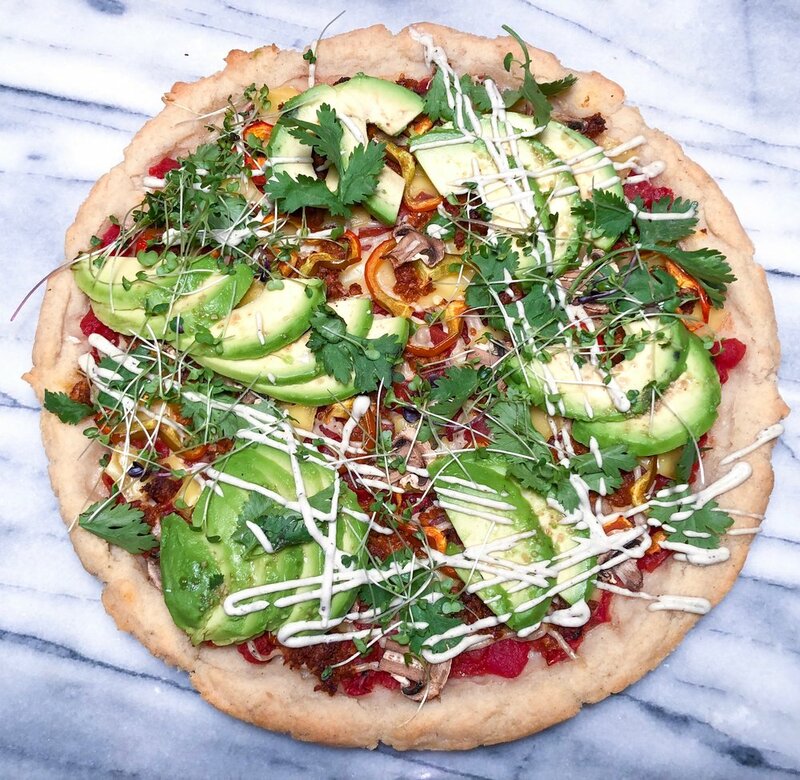 Although this pizza isn't entirely guilt free, its plant-based, gluten free, and right up my alley for when I'm seriously craving pizza... or tacos... or pizza. This pie has me thinking of an entirely different world of possibilites. Soyrizo, cashew cream, tomatoes, cilantro, avocado and peppers will make your life complete and your mouth water. I conveniently had all of these ingredients in my pantry and fridge when the idea sparked and it made me realize I'm probably not the only one! I'm hoping this is an easily accessible meal, where you already have half the ingredients! This gluten-free pizza crust and I have had a LONG relationship. Testing and tweaking for years, I tweaked it a lil more for this concept. Adding a bit of masa flour (corn flour) to the recipe, really made this crust give me the taco feels. The dough rising is a step you CANT miss. It helps the yeast, flavor and texture develop beautifully! If you skip it, you'll have a crunchy pretty tasteless crust. Trust me on this one. Go for a walk, watch a movie, do whatever you gotta do while this baby rises to perfection. 1 packed instant dry yeast. In a stand mixer (or bowl) add one packet instant yeast, 1 1/4 cup hot water (as hot as the tap goes), 1 tbsp sugar and let sit for 10 minutes or until the yeast is activated. You'll know its ready when theres a lil layer of bubbles and "foam" covering the water. In a separate bowl add masa flour, salt, tapioca flour and 1 cup of flour blend. Mix well. Turn your mixer on the lowest setting with the dough hook (or just mix with your hands or large spoon, it'll be messy, but worth it) and add the flour mixture you made above slowly. Tap the sides of the bowl while its mixing to incorporate all of the flour. Slowly add in the rest of the flour 1/4 cup at a time. You might need more or less depending. You'll know when you've added the right amount when the dough isn't tacky/ sticky to the touch but not dry and cracked. Line a separate medium sized bowl with olive oil (avocado oil works too!). Form dough into a ball and let it chill out in your greased bowl. Cover with a damp cloth (this will keep it from drying out) and let it rise for 2 hours. 1 cup soaked cashews (overnight or in hot water for 10 minutes). In a high powered blender or food processor add 1 cup soaked cashews, 1/2 cup water, juice of 1 lemon, 2 tbsp nutritional yeast, 2 tsp coriander, salt to taste. Blend for about 4 minutes until smooth & creamy. Put in the fridge and set aide. Tip- save the leftover cream in the fridge for up to a week & use on eggs, tacos, toast, soup, whatever! Pre heat the oven to 400*. Grab a 1/2 sheet pan or a 12" round pizza pan and grease with a lil oil. Pull your dough out of its bowl and press it evenly around the pizza pan. It won't have the same consistency as traditional pizza dough, as you will have to form it to the pan, and it'll be a bit sticky. If you find the dough is sticking to your fingers too much, flour or oil your fingers. Once you've pressed the dough, top with tomatoes and cover with cashew cream. Then add the soyriso, peppers, cheese, & mushrooms. Bake for 25-30 minutes. Once the crust is golden and easily lifts off the pan its done! Add avocado, cilantro, more cashew cream and even some hot sauce if you're feelin' it! Slice and serve immediately. Its great for leftovers too (just omit the avocado)!